I have been feeling some feelings lately. Like, feelings of well-being. Like, spontaneous-breaking-into-song-and-general-wonderfulness-type feelings. I know… It sounds pretty floofy, but I can’t help it. And I can’t explain it either. I do not know where the feelings came from, when they started, nor why they’ve been persisting. Maybe it’s menopause? Or some sort of hormone imbalance? Could that be it? I don’t know… It’s a combination of things I figure. Like the fact that I have such a fine husband… Or the fact that I’ve been graced with three healthy/crazy/amazing offspring maybe?… Or maybe it’s that I’m doing what I love everyday. Whatever it is, I’m feeling darn blessed. In fact, that’s where this little ornament comes in. It was inspired by our home and all those feelings I’ve been feeling. I call it the “Heart House Ornament” and it is the final installment in the Ornament-ED series! Before I Begin: I made two versions of this ornament. 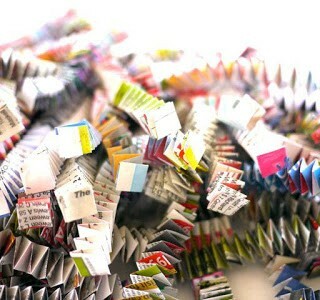 The first one I made out of a tissue box; the second one I made out of old greeting cards. In my opinion, the greeting cards were about 100 times easier to work with because the cards are quite a bit thinner than the tissue box. 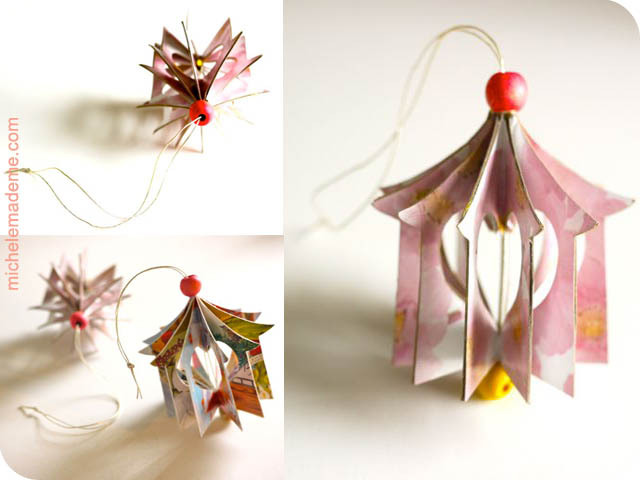 Also the finished greeting card ornament is as light as a feather. So, yes, if you’re going to attempt this ornament, don’t think twice. USE GREETING CARDS. 1. Start with either greeting cards or a tissue box. 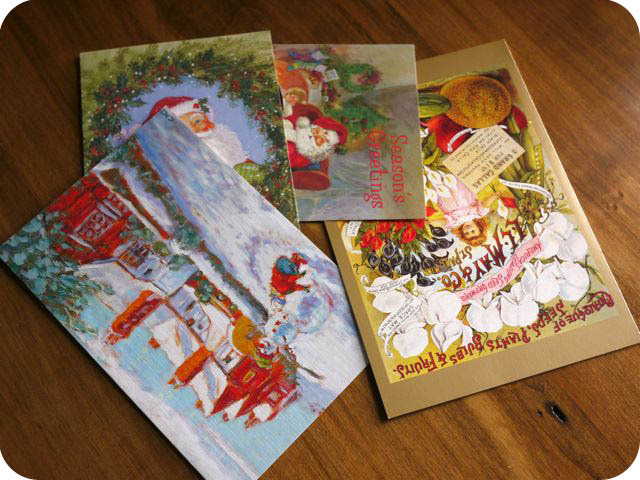 To give my greeting card ornament a cohesive look, I chose several muted Christmas cards of similar style and colour (as above). 2. Create your template similar to the one below. I made mine out of a cereal box. Note that the right and left sides of the template MUST BE mirror images of one another. 3. Using your template, trace and cut out twelve identical houses. Fold each house along its center line. 4. Take a house and apply glue to half of the bad side. 5. Take a second house and join it to the gluey house, bad sides together. Clamp this pair with a clothespin or two. Repeat steps 4 and 5 for the remaining 5 pairs of houses. You now have six pairs of half-glued houses. Now apply glue to the bad side of half a house in a pair and glue two pairs together. Continue glueing pairs together until you have 3 groups of four houses. 6. Now glue all groups of 4 together as before and clamp as shown in photo #6. Allow to dry. 7. Glue the two end houses together to create the completed heart house. Clamp and let dry. Gather your beads and string. 8. Place a bead on your string. Now thread both ends of your string up through the heart house. Once through the top, place a second bead on your string. Tie the ends of the string to make a hanger. Trim the string ends if necessary. Apply glue to the very peak of your house to adhere the upper bead to the house. Don’t look now, but the cute heart house is complete and ready to hang! It reminds me of a itsy garden gazebo or merry-go-round, hee hee. On that note, it is time to bid a fond farewell to this little series… Goodbye sweet series, à la prochaine. I certainly hope you’ve enjoyed my ornamental foray. 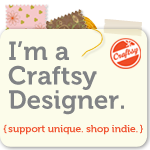 I’ve got to get to some gift-making now, wouldn’t you say? I best get at it quick! Have a happy weekend. I’ll be back here on Tuesday. Thank you very much! The tutorial is great! wow! These are beautiful! Definitely going to give this a go! I love the way your brain works. Talk about making a silk purse from a sow's ear. Wow. So happy you are happy! I just adore this little house. I hope to make one! How wonderful. I love it when easy can be Beautiful. So pretty! I sure hope to make one, cause these houses make me happy too!! You are brilliant and your creations are wonderful and full of poetry! THANKS! Ciaoooo! 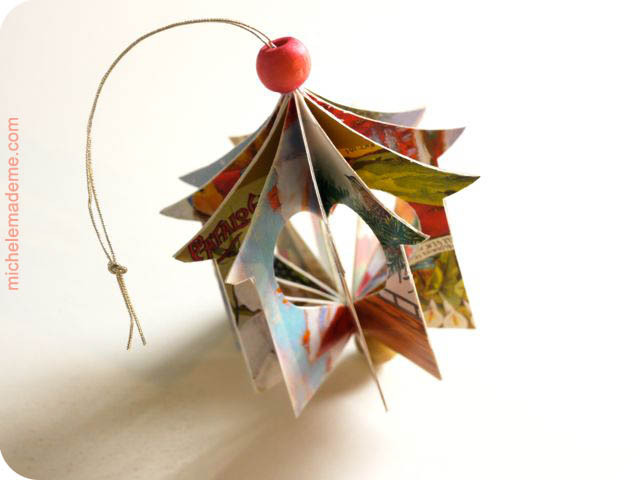 That is really lovely, so effective, what a good use of old Christmas cards too. Excuse my while I bite my hand and gasp…one of my new favorite Michele creations! 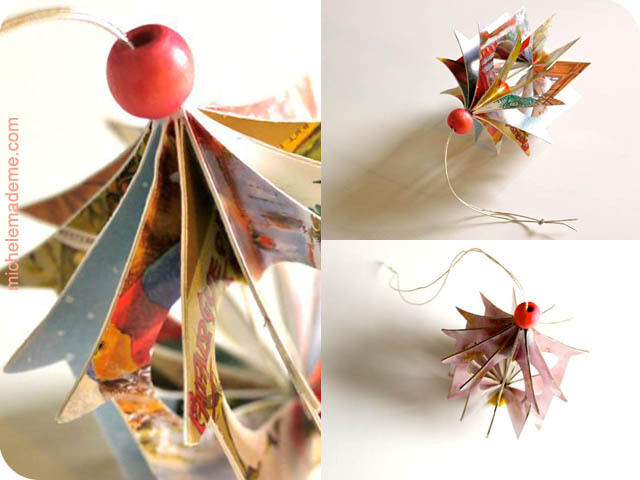 The heart, the house, the delicate intricacy, the recycled cards! LOVE. I must admit, this is my favorite too! Well done. Very cute and clever! And, it's great you're having a good time with it. 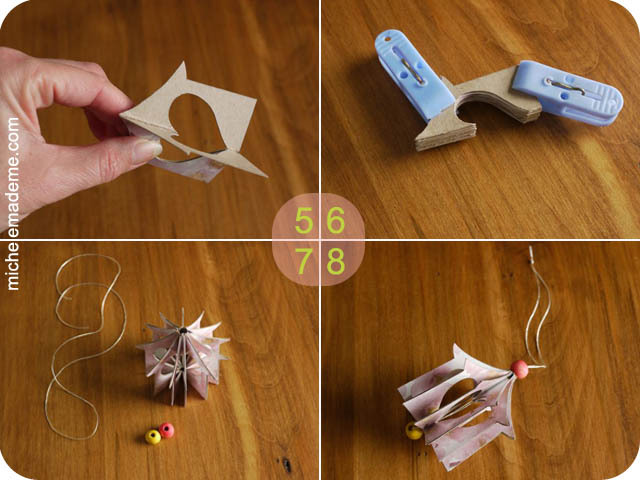 So simple, yet wonderful, ornaments! I love this one! I have to try it! Thanks for sharing. I just love this one and it's something I think I can actually achieve!! Thanks for another great idea Michele. 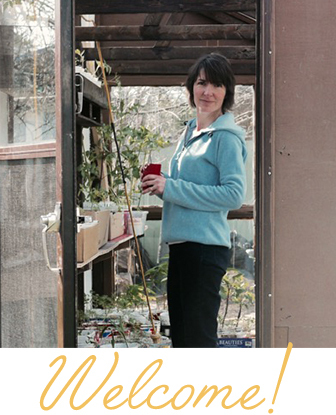 This a such a great project…pinning this for my next to do! Just love this Michele and I just happened to have some greeting cards stashed away for that special project. Thanks for Tutorial! This is so beautiful! Now I have something to do with old Christmas cards other than recycle them. Thank you! So, so pretty. It reminds me of an itsy bitsy gazebo . So glad you are feeling well! So cute!!! Do you have a template to share?? Hi Anonymous, I don't have a template printable but a template can easily be drawn up from the instructions. Best of luck! Yes, I made a template from the instructions. So anxious to try this over the weekend. I just love your website. My template is about 4 inches tall, is that about right? Hi again Anonymous, My house is 3-1/2 inches tall so I'd say yours'll be just great! Have fun! Thanks for the step by step explication! This may well be one of my favorite things you've made – so perfect in its simplicity! LOVE this idea and looking forward to trying it! So fun! 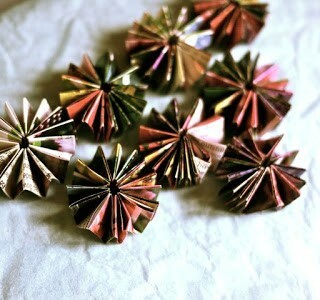 I will make these with my very precocious six year old niece ! i was wondering where i can buy an exacto knife. Beautiful! And the photos of the ornament are gorgeous… great angles. Just gorgeous! Lovely idea for those cards you can't bear to recycle. love this idea and it is adorable but both my daughter and I are stuck on number 6 and can't figure it out.. if you glue any of the pieces together at this point then you end up with 9 half houses in a circle but when I look at yours there are 12 so I'm obviously doing something wrong but can't figure out what??? Help! Hi Anonymous… You're stuck on number 6? Okay… Whenever you apply glue to any house, try applying it to the same side every time. For example, if you start by putting glue on the left side of your first house, do the same with every other house. That way when you bring groups of houses together, you shouldn't have a problem. I hope this helps. Fingers-crossed! Send me an email if you need more clarification, okay? Lindo demais! Obrigada por compartilhar suas idéias maravilhosas! Hello, are you able to specify exactly how you make the sides of your template mirror images? Forgive my ignorance, I just don't completely understand that part of the process. To get a template that has two identical sides, fold a piece of paper in half and draw only one side of the design on the fold. Now cut out the design while the paper is still folded. Once the design is fully cut out, unfold the paper. That should give you a template with identical sides to start with! Oh my goodness! What a memory we made this weekend creating these. I've done a dozen of them. 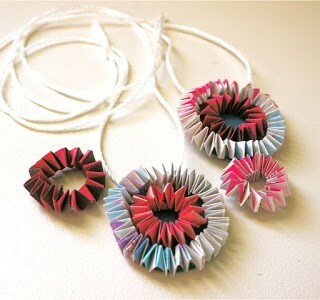 Blogged about it here: http://www.jessicaflores.com/my_weblog/2012/12/last-weekends-diy-obsession.html Thank you!! can u provide a copy of your template? Beautifully made and designed. Thank you for sharing. thank you so much, I just have made my first one! Love this idea and will be making these with my special needs learners in the run up to Christmas. Thanks for sharing. I love your feelings. I love what came of them. Thank you for sharing. love this. I hope to start a crafters small group at our church this will be one ornament we will use. I have one question what are the measurements of the house template width x height. when I copied mine over I thought it looked a bit small. 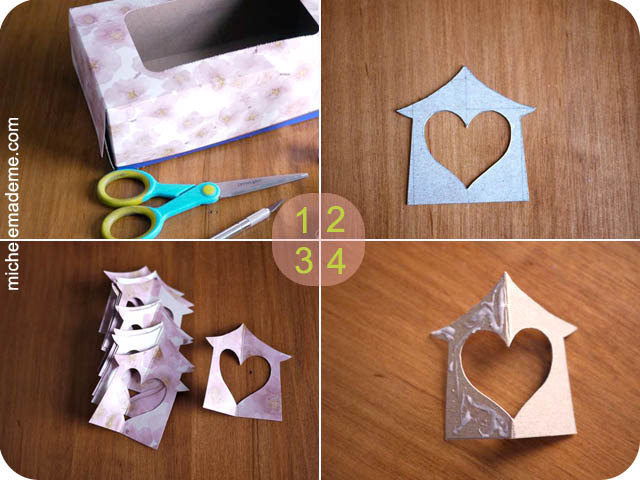 can you make these with any shapes or does it have to be the house and heart?